BEIJING Assailants attacked police and other people with knives and set fire to police cars in China's restive far-western Xinjiang region on Wednesday in violence that killed 27 people, one of the bloodiest incidents since unrest in the regional capital killed nearly 200 in 2009. Xinjiang is home to a large population of minority Muslim Uighurs but is ruled by China's Han ethnic majority. It borders Central Asia, Afghanistan and Pakistan and has been the scene of numerous violent incidents in recent years. The early-morning attacks; described by state media as riots; also left at least three people injured in remote Lukqun township in the Turkic-speaking region, the official Xinhua News Agency said. Police stations, a government building and a construction site were targeted in the violence, it said. Xinhua said the attackers stabbed victims and set fires, killing 17 people including nine police or security officials, before officers shot and killed 10 of the assailants in Lukqun in Turpan prefecture. The agency cited officials with the region's Communist Party committee. Xinhua did not provide details about the cause of the unrest and it was impossible to independently confirm the report. Information is tightly controlled in the region, which the Chinese government regards as highly sensitive and where it has imposed a heavy security presence to quell unrest. However, forces are spread thin across the vast territory and the response from authorities is often slow. An official reached by phone at the press office of the Xinjiang Public Security Bureau, the region's police, said she had only seen news of the violence on the Internet and had no information. Other officials at the county's propaganda department and police said they also had no details. Calls to the region's government spokeswoman, Hou Hanmin, rang unanswered. Though it remained unclear what caused Wednesday's violence, police stations, government offices and other symbols of Han Chinese authority have been targets of attacks in the past. The attack occurred at 6 a.m., when most residents would still be asleep. The report said three assailants were seized, and that police pursued fleeing suspects, though it did not say how many. It said three people were injured by the unrest and were being treated. A man in Lukqun contacted by phone said the area has been cordoned off and armed police officers were posted at road intersections. Police, anti-riot forces and paramilitary police were patrolling the town armed with pistols and machine guns, said the man, who refused to give his name out of fear of government reprisals. "People are not being allowed to walk around on the streets," he said before disconnecting the call. The violence came two months after a deadly clash in a town near Kashgar, elsewhere in Xinjiang killed 21 people, including 15 police officers and community workers. Ethnic riots occurred four years ago in Urumqi, the regional capital. Uighur activist Dilxat Raxit, spokesman for the Germany-based World Uyghur Congress, said Wednesday's violence was triggered by Chinese government policies of "sustained repression and provocation" of the Uighur community. Many Uighurs say they suffer discrimination in jobs and in obtaining loans and passports, and that Beijing imposes tight restrictions on their religious and cultural life. Children and women are barred from attending mosques, and fasting is discouraged during the Muslim month of Ramadan, which starts this year in early July. The Chinese government says all ethnic groups are treated equally and points to billions of dollars in investment that has modernized Xinjiang, a strategically vital region with significant oil and gas deposits. 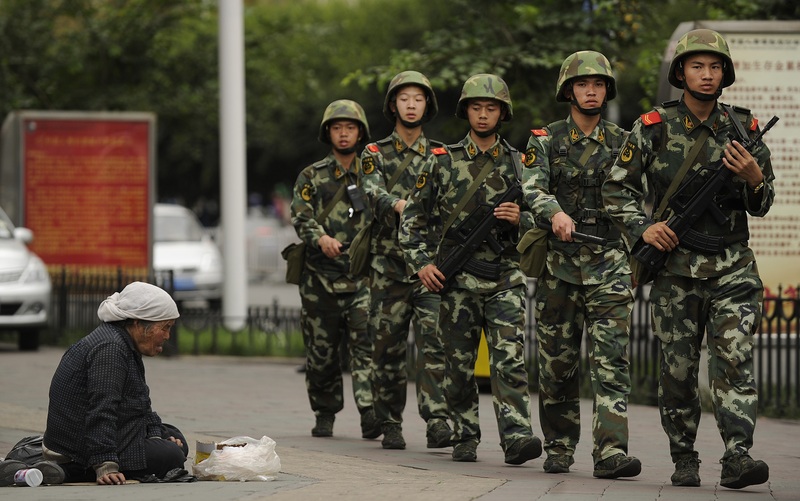 Duncan Innes-Ker, an analyst at Economist Intelligence Unit, said the latest unrest shows that the government needs a new strategy to resolve ethnic and religious tensions in Xinjiang. "Its past efforts to address them with tight security and economic development have been a manifest failure," Innes-Ker said. The township of Lukqun is about 150 miles southeast of Urumqi along the ancient Silk Road connecting China to Europe. It is part of an area that includes Turpan, a tourist destination with distinctive Central Asian architecture.